A combination of file photos show Russian President Vladimir Putin (L) and his French counterpart Emmanuel Macron. 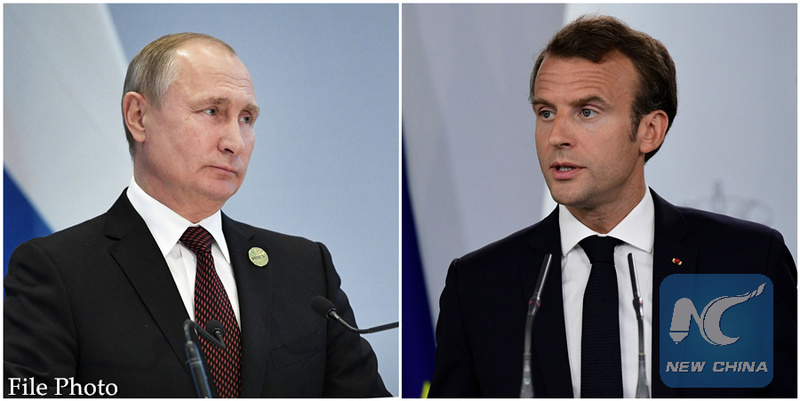 MOSCOW, Aug. 10 (Xinhua) -- Russian President Vladimir Putin and his French counterpart Emmanuel Macron discussed Syrian issues during a phone conversation Friday, according to a Kremlin statement. "Vladimir Putin stressed the importance of the international community continuing to restore the social and economic infrastructure of Syria and return refugees and temporarily displaced people to their places of permanent residence," it said. The two leaders appreciated the Russian-French operation in July to deliver and distribute humanitarian aid to the people in Syria's Eastern Ghouta, it said. A Russian military transport aircraft delivered 44 tons of humanitarian aid, including medicines, clothes, tents and other essential items, from France to Syria on July 21, the Russian Defense Ministry said then. The cargo was distributed to the civilians in urgent need of assistance in Eastern Ghouta, a collection of farms and towns near the Syrian capital of Damascus.